I just bought the Cherry Vibe today and I drilled it according to Hammer’s High RG Length Layout. The lanes were very lightly oiled and broken down because of a birthday party that was on the lanes before I was. The ball went long and had a nice, strong arc to the pocket. It was very forgiving and carried the corner pins well. It is very versatile, as I was playing an almost straight line to start, and later swinging it out from the 15 to about the 5. It would hit the dry and make a strong move to the pocket. I ended up shooting 289 and 234 in 2 games with it, and I was very impressed. I would recommend this ball to anyone looking for a very strong, dry lane ball. I don't know what to tell you but this is quickly becoming more and more of a favorite. 5x5.5 and 5x4 w/xh.....I love the fact that I can play this everywhere. Even on oil when you need to be straighter the Cherry vibe is predictable and controllable. Dont let this make you think that it lacks power. The Cherry Vibe is an awesome addition to any aresenal. "See my vise as it rolls down the lane....you can't it revs too much"
I got this ball to go long and snap at the end. Man does it ever! This ball scares the crap out of me and doesn't start hooking until like 40-50 feet down lane and it snaps so hard. This is the master ball for when the lanes have broken down. I just got a 15lb Cherry Vibe drilled today. The pin is next to the ring finger and the CG is in the palm. I got this ball to go under my Black Widow Pearl because I needed a ball that would clear the heads and mids on medium-light to light lane conditions. Also I didn't want a ball that overreact off the dry. This ball has amazing length, clearing the heads and mids with ease. No matter how dry the heads and mids were, it made it through. When it hit the break point, it made strong move to the pocket. The Cherry Vibe is definitely a good controllable skid flip ball. I was amazed how versatile this ball was. I can use this ball to go straight at the ten pin, and play the deep hook ball. For the price, this a definite value. "Now rolling Hammer and Storm"
Just bought one last night to combat the ever decreasing lack of oil at my house. Was using a Hammer High Rev prior, but it was grabbing too much in the mids unless I threw it 100 mph. As noted, the Cherry Vibe goes looooong and finishes hard. Don't know the exact specifics on the drilling, but very similar to the attached picture in prior review. Drilled up the cherry last night cg center of span pin over ring typical layout. Threw it 5 games after highschool meets on a less than fresh shot played 10 up 5 and started off a lil slow with a 203 but by the fourth game got lined up and shot a 300 finished with a 268. tried it this morning on a travel league on a fresh shot played 8 up 5 shot 738 with front 9 before a 8-10 in the pocket in the second game. For the money you'll be hard pressed to find a more versatile yet hard hitting ball on the market. I don't throw the ball very hard but i was sending pins flying all over the place it really mixes up the pins. I have to admit that this ball is strogner than advertised. It is suppose to be for medium to light oil but it really handles medium. From juding from the Hammer Arsenal i have, the Cherry Vibe is 2 to 3 feet longer than the Blue Vibe with a ton of backend. On a normal THS, i compared the CV to my BWP. Both looked very similar in a way except for the BWP having a stronger midlane and a little less backend. On the THS i can play out and straight up the lane with no problem. The CV responds to different hand positions well and hits like a mad truck. The pins stay low and fly across the deck like no other. It's amazing. I believe this ball will make it to one of the ball of the year categories for sure. I love this ball had it for a few months to solve my dry problem. This ball can be a bit of a problem child because it is ill advertised. It is much stronger than anticipated. Specs: 270-300 rpm, low axis tilt, medium axis rotation, 18-19 mph. Ball reaction: Oh yes. Bring on the dry. I tried throwing this on an oily shot, lots of hand, down to about 15 mph straight down the 10 was the only way this came back, and it wasnt even that oily of a shot, more like a medium-oily shot. This ball I have noticed handles all length of oil with a good, predictable, strong backend motion I have not seen out of any ball for "entry" level performance. That being said, I throw this ball my regular speed about 15-7 on a shot that is dry, and it will come back with some hitting power. This is the drill type you wanna get for this ball if you want a dry lane condition ball, it also responds very well to hand position and speed adjustments. 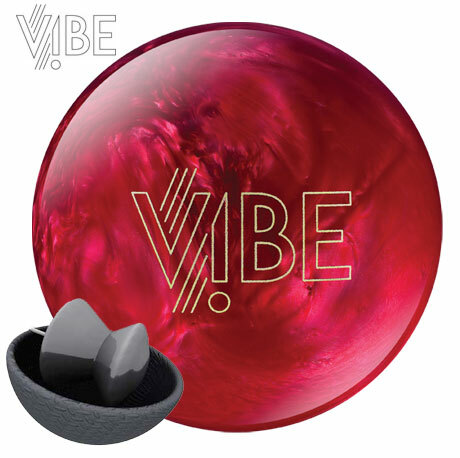 Overall: The Cherry Vibe is another great ball from Hammer, just be weary of how reactive it actually is. And this thing does soak the oil, if I could stand having oil come out on my hand on my shots I might neglect cleaning it but I cant, needs a bath along with the rest of the stuff once every week or two. This ball has great hitting power, only beat by my Anger and BW. Nothing hits like a Hammer, baby. Bowling is great,but family is the most important!! Bought a 15 lb cherry Vibe just before Christmas to use on normally very oily lanes as a 'spare ball' for my Resurgence. Big mistake for a spare ball, but worked great when my resurgence was hooking way too much. I used the Vibe to salvage two decent games as a first ball, getting strikes with some regularity from the outside (over the first arrow). BUT on spares it hooked out on a ten pin. Made a 90 degree turn just in the last foot or two, and chopped the 3-6 off the 3-6-10 twice off hits the looked perfect on the right side of the 3 pin. Much better to use plastic on the 10 pin or set ups like the 3-6-10. This is the first ball I've felt compelled to post about. While I've liked many others, this is a ball that I feel just isn't getting its deserved praise. Like many others, I bought this ball in September for drier lanes, and didn't expect it to do much. Pin (about 3") - in bridge, one inch above fingers; CG on midline, very slightly kicked out, no weight hole needed. This ball crosses more boards than anything else in my abundant arsenal. Having more hand than almost all lefties, it's rare that I can play this ball outside of 3rd arrow on THS. On fresh back-ends or short sport patterns, this ball is just far too much in the back. On lanes where carry-down or spotty heads starts plaguing pin-carry, this ball gives you a look UNLIKE ANYTHING ELSE OUT THERE. It goes straight for 40 feet and then just makes a right turn. Unlike other balls which give tremendous length, if I miss in, the ball doesn't skid right past the pocket or leave a weak corner pin, but picks up the roll and levels the pins. I HIGHLY RECOMMEND it for players with higher rev rates and speed, but think that it is too over-under for strokers or weak tweeners. I've even had success on my difficult collegiate conditions with oil patterns from 42' and up. I target 10 as my breakpoint, and just adjust my feet as needed. While this should never be your first ball out of the bag, the reaction is far too unique for every power player not to own one of these. This might be the best Game 3 ball I've ever owned. If you think lefties aren't versatile, come and watch me sometime.